Now stocked in 3,000 customers in 19 countries, Joe & Seph’s is proud to work with customers including Waitrose, Ocado, British Airways, Cineworld Cinemas, Claridge's Hotel and many more. 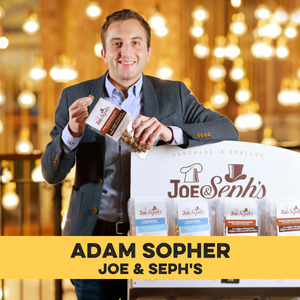 Joe & Seph’s have been fortunate to win a number of awards including the Grocer Gold Award for Exporter of the Year in 2015, the FDF Exporter of the Year in 2016 the Grocer New Product Award and Sweets & Snacks Middle East Best New Product Award. Adam will be part of our panel on "Non-retail routes to market" on Friday. Get your tickets here.